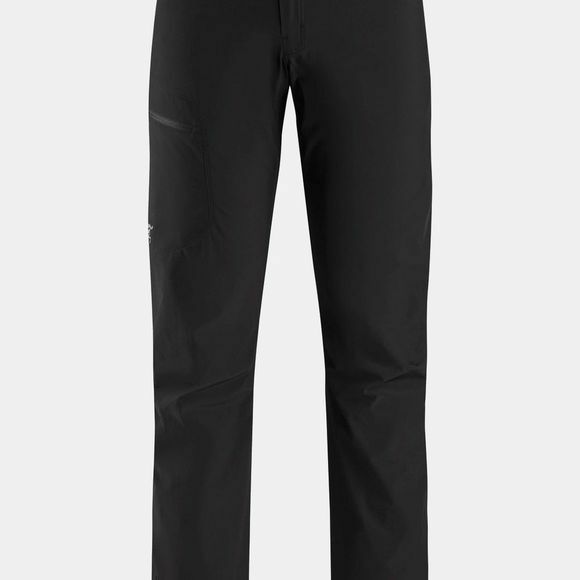 Made from light, hardwearing TerraTex fabric, and designed with freedom of motion in mind, the Arc'teryx Men's Lefroy Pants are technical trousers built for extended trips across demanding terrain. Durable and comfortable, TerraTex is a nylon blend geared for warm weather hiking and trekking. It delivers sun protection, dries quickly, and has performance stretch. The trim fit is streamlined and lies close to your body. This minimises excess fabric that would otherwise get in the way while negotiating technical terrain. Articulated patterning and a gusseted crotch work with the fabric's stretch to deliver the freedom of movement needed to handle steep grades and shifting topography. The waistband lies flat under a hipbelt and is lined with comfortable, moisture wicking brushed polyester. Pockets are carefully selected and placed for superior efficiency while wearing a pack. Streamlined cargo pockets on each thigh secure with a low profile laminated zip and have a volume pleat for more effective storage of larger items. Slash hand pockets provide simple, easy access small essentials.